"Escape to the Safest Place in the World"
Belize is in northeastern Central America. Mexico to the north and northwest, with the Caribbean Sea to the east, and Guatemala to the south and west. Belize, until 1973 was known as British Honduras, became independent in 1981 and is a member of the Commonwealth of Nations and is part of the "Tax Free Caribbean Zone". 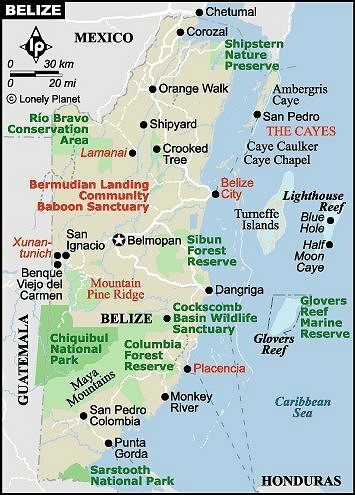 The total area of Belize is 8,867 sq mi. (About the size of Massachusetts). 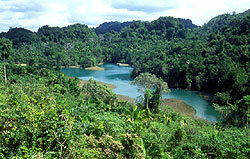 The northern half of Belize consists of lowlands, large areas of which are swampy. The southern half is dominated by mountain ranges, notably the Maya Mountains, which rise to a maximum elevation of 3,675 ft atop Victoria Peak. 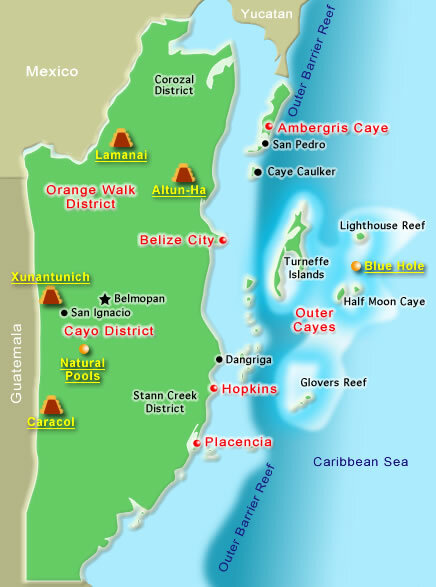 Coral barrier reefs and numerous Caye (islets) fringe the Caribbean coastline. The principal streams are the Belize River; the Río Azul, which forms much of the boundary with Mexico; and the Sarstún River, which forms the southwestern boundary with Guatemala. The climate of Belize is subtropical, moderated by sea breezes along the coast. The average annual temperature is about 79° F. The total annual rainfall increases from north to south and averages about 71 inches. A rainy season extends from May to February. Some 86 percent of Belize is covered by forests. Deciduous trees are found in the north; tropical hardwood trees predominate in the south. Principal species include the commercially important mahogany, cedar, and rosewood, as well as pine, oak, and palms. Mangrove swamp vegetation is found along the coast. Wildlife includes jaguar, deer, tapir, and numerous species of birds and reptiles. The majority of the population of Belize is of mixed racial descent. The largest group is of black or partly black ancestry. Other groups include Native Americans, principally Carib and Maya, located in the north and west; people of European descent, mainly English and Spanish; and people of mixed Native American-European descent. The population is concentrated in a few principal urban centers, of which Belize City is the largest. Belize City in eastern Belize, at the mouth of the Belize River, on the Caribbean Sea, is the country's chief seaport. Timber, wood products, sugar, fish, citrus fruit, and bananas are exported here. Major industries are sawmilling, food processing, and fishing. Of note are Saint John's Anglican Cathedral and Government House (both early 19th century). Located in an area where the Maya peoples once flourished, Belize City was settled in the early 17th century by British adventurers. In 1884 it became the capital of British Honduras (renamed Belize in 1973). Belmopan officially replaced the low-lying city, which is vulnerable to hurricanes, as the capital of Belize in 1972. Belmopan, on the Belize River, about 50 miles from the Gulf of Honduras (an arm of the Caribbean Sea), a newly constructed city, supplanted Belize City as the official capital in 1972. 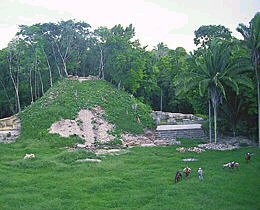 The protected inland site of the city, in an area where the Maya once flourished, was selected as the new capital of Belize after coastal Belize City was devastated by a hurricane in 1961. Construction began here in the mid-1960s, and Belmopan became the seat of government in 1970. It was officially inaugurated as the capital in 1972. Though English is the official language other languages spoken include Carib, Maya, Spanish, and a Creole dialect of English. More than half the people are Roman Catholic, and most of the remainder are Protestant. Placencia has sixteen miles of natural sandy beach, a virgin mangrove-fringed lagoon, a wonderland of coral-studded cayes, nearby jungle rivers and pristine rainforest Garifuna, Creole and Mayan cultures and ancient Mayan ruins make Placencia the ideal location for a great gateway! Ambergris Caye is the largest island in Belize. San Pedro is the only town on the island. Ambergris Caye has been the hub of Belizean area maritime trade for centuries. Fishing, coconuts, and chicle were historic means of islanders support, but the last thirty years have led to a large growth in both the Belize dive and scuba trade, and ecotourism. The rich variety of things to do in San Pedro Town makes Ambergris Caye the gateway to Belize. San Ignacio, along with its neighbor Santa Elena, make up the second largest urban area in Belize. Far from Belize’s famous beach and island destinations, Situated between two rivers in a forest region, San Ignacio is also home to some excellent nature excursions in addition to the modest Mayan ruins of Cahal Pech nearby. There are kayak rentals, as well as bicycle rentals. The city itself is fairly compact, but the area is rich in scenery so a bicycle is an ideal way to see some of the outlying sections. Each Saturday the locals all come together for a popular food market featuring loads of tropical specialties native to the area. San Ignacio is near the border of Guatemala and a popular stopover for people traveling between Belize City and the Flores/Tikal ruins. Education is compulsory for children between the ages of 5 and 14. Attendance at primary schools was near universal in 1996, but only 50 percent of secondary school-aged children were enrolled. 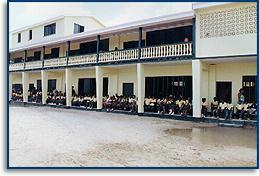 Higher education is available at colleges in Belize City and Corozal. The literacy rate of 91 percent is one of the highest in Latin America. 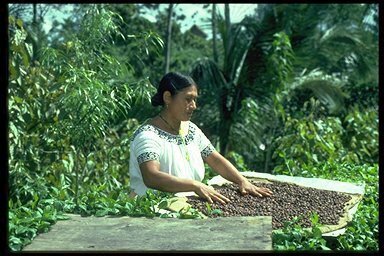 The main economic resource is Belize's arable land, although only 3 percent of the total land area are under cultivation. 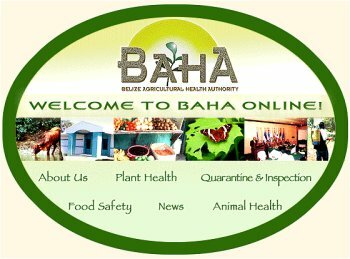 Agricultural exports include sugar, citrus fruits, and bananas. Rice, beans, and corn are grown as subsistence crops. Lumbering, formerly the chief economic activity has declined in importance. Major manufactures are processed food, wood products, and clothing. A road network of 1,707 miles links the major urban centers, but some areas remain inaccessible. An international airport serves Belize City. In pre-Columbian times Belize was part of the territory of the Maya. It was included in the Viceroyalty of New Spain in the 1500s, and sometime later English woodcutters from Jamaica established a settlement on the Belize River. During the wars between England and Spain in the 1700s, Spain failed to dislodge the British from the area. In 1836, after the emancipation of Central America from Spanish rule, the British claimed the right to administer the region; it was declared a British colony, subordinate to Jamaica, in 1862 and an independent crown colony in 1884. Belize is governed under a constitution that became effective at independence in 1981. The British sovereign is head of state and is represented by a governor-general, who has little power. A cabinet of ministers, led by a prime minister mainly exercises executive power. The bicameral National Assembly consists of a Senate of 8 appointed members and a House of Representatives of 29 members elected by universal suffrage to terms of up to five years. The prime minister must have the support of a majority of the members of the House. The leading political parties are the People's United Party (1950) and the United Democratic Party (1974). The British initiated long-range constitutional reforms in 1954, resulting in a new constitution ten years later. Progress toward independence, however, was hampered by an old Guatemalan claim to sovereignty over the territory. When Belize finally attained full independence on September 21, 1981, Guatemala refused to recognize the new nation; about 1,500 British troops remained to protect Belize from the Guatemalan threat. Manuel Esquivel replaced Prime Minister George Price of the United Party, who had led the country to independence, when Belize held its first national elections, on December 14, 1984. Price returned to power after the elections of September 1989. In May 1993 the United Kingdom announced that it would end its military involvement in Belize. All British troops would evacuate the country by October 1994. Esquivel regained the prime ministership in June 1993 elections. In July Esquivel announced the suspension of a pact reached with Guatemala during Price's prime ministership, claiming Price had made too many concessions in order to gain Guatemalan recognition. The pact would have resolved a 130-year-old border dispute between the two countries.